This past Saturday was Free Comic Book Day, and my family and I went to one of the comic stores in our area to partake in the festivities. Unfortunately, as we do not have the logistics to accurately plan a time of departure with a five-week old daughter, we missed out on many of the events at Heroes And Dreams. Fortunately, we did not miss out on the free comics! 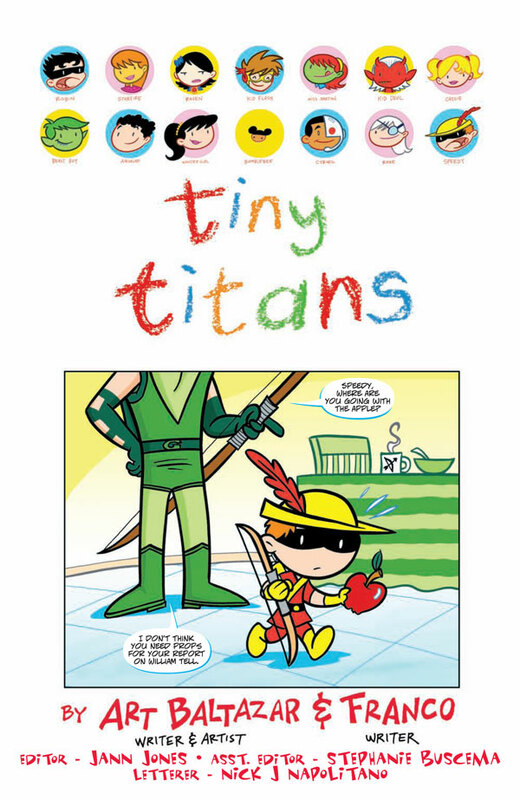 I picked up a copy of Gemstone Publishingâ€™s EC Sampler, my wife chose the Bongo Comics Free-For-All, and we picked up a copy of DCâ€™s Tiny Titans as our daughterâ€™s first comic. Iâ€™ve always been amazed by the EC line of comics. The art work always seemed so detailed and the stories where like something straight out of nightmares, but I never have had a chance to read a lot of them. Many modern comic and prose authors site the EC line as influential in their work, and this little collection has a good sampling of why. There are four stories reprinted from various classic EC publications, and they will all keep you on the edge of your seat. The first story reprinted in this volume is Spawn Of Venus, written by Bill Gaines and Al Feldstein with Feldstein handling the art chores. It originally appeared in WEIRD SCIENCE #6, back in 1951. Today, you can find it in this reprint and in the EC ARCHIVES – WEIRD SCIENCE Vol. 1 hardcover, published by Gemstone. Spawn Of Venus tells the story of five astronauts mission to Venus, and how the two survivors brought back a nightmare to Earth. Great old fashioned sci-fi worthy of the Dimension X radio show. Dying City is the second tale, written by Harvey Kutzman with art by Kutzman and the legendary Alex Toth. First published in 1951â€™s TWO-FISTED TALES #22, this is the story of a young South Korean boy who, thinking that a gun gives him power and that war is the way, joins the North Korean army. When he returns to his village to bring his civilian family north, his grandfather shows that the boy truly had no idea what war could lead to. Poignant story that you could see be re-told today. In the plan old, straight horror-suspense with a twist category, we have Curse Of The Full Moon, written and illustrated by Johnny Craig. The story was part of 1950â€™s THE CRYPT OF TERROR #17, and is still a good read. A man believes that he is the were-wolf that has been killing people while he is on vacation in Europe, but he so finds out that sometimes the hard evidence can be interpreted different ways. The final story, Under Cover, was from SHOCKING SUSPENSTORIES #6, 1953. 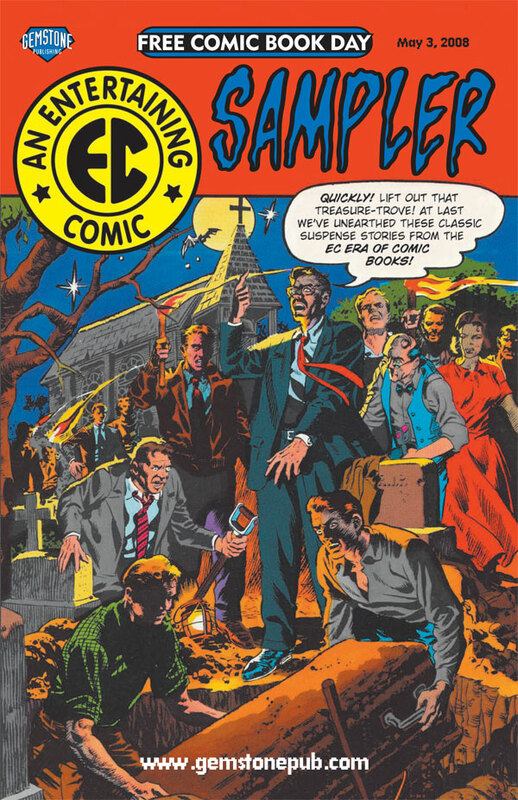 Bill Gaines and Al Feldstein wrote this tale of a young reporter who uncovers more than he hoped for while secretly writing an article on the hooded Black Vigilante Society, a racist organization. The beginning of this story promises a twist, and the pay-off is worth it. What is worth more though is the classic art by the spectacular Wally Wood. If you have never read the original, or the reprints, of the EC Comics, this is a great little primer. With it you not only get four great, classic stories reprinted and restored, but something far from the capes and tights set. The EC SAMPLER from Gemstone Publishing deserves, and gets, 4 out of 5 stars! 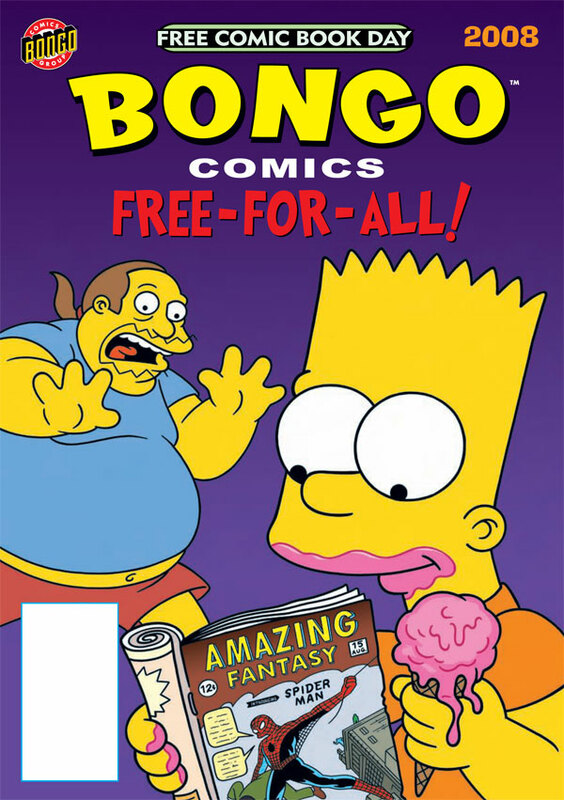 My wife picked this issue up, partially out of her love of the Simpsons, partly for the hilarious cover. Later that night, I head her laugh out loud several times while reading it, and knew that she was enjoying it. In the first of three stories, we have Stretch Dude (Bart) and Clobber Girl (Lisa) in a battle that pits them against the villainous Judge Mental and later the League of Women Voters! Ian Boothby has written a great script, and it hits all the Simpson beats while throwing in some super-hero action as well. After a short battle with Judge Mental, Stretch Dude and Clobber Girl are shocked to find that the Mayor has passed a law banning super-heroes from the city! Will Stretch Dude and Clobber Girl hang-up their costumes for good or will they be forced to break the law to defend the people! John Delanyâ€™s pencils have that Simpson look, and the homageâ€™s to storyline and super villains that every reader should recognize make for a fun story. Second, we have a very television inspired story from James Bates. All I got to say is, thank goodness they did not make this a scratch and sniff issue! Angry at Marge for her interrupting his 48 hour Krusty vs. the Monsters movie marathon, Bart decides to go on a stink strike! But soon, Bart finds that his stink strike is affecting his social life at school and decides to change tactics. Oh he still stinks, but he learns a lesson that all kids his age should. You may be young and determined, but parents can be old and sneaky! Great little story that has some really good one-liners peppered throughout. The last story was, odd. Written by Chuck â€œBatman and the Outsidersâ€ Dixon, it takes a look at how the Simpson comics are supposedly translated into Japanese Manga. James Lloyd draws Jake, the Bongo Intern, as he shows us a sample of a Japanese Simpsonâ€™s story from the fictional â€œLaughing, Laughing, Everyone Is Laughingâ€ comic. A weekly three thousand page manga with over a hundred million readers, this stoy may be a treat for actual manga fans, but it just left me cold. From Bartomuâ€™s exclamation of â€œCONSUME MY SUPORT APPAREL, LOSERS!â€ to the appearance of Lisayama the Avenging Sisterâ€™s promise to a baseball demon that, â€œI will jet-ski on a lake of your blood!â€ I was just left cold. I know that the point of this story was satire, but I just did not care. The artist successful gets a manga style and Dixonâ€™s script sounds like poorly translated Japanese, but Iâ€™m just not a fan. I would have rather seen a Radioactive Man story. Overall, my wife liked the book, and that was the point. I give it 2.5 out of 5 stars. If you are a Simpson fan, go for it, youâ€™ll love it. If not, you might want to try another Bongo title, or just be prepared for a print version of the television show. We picked up the TINY TITANS #1 FCBD Edition as a little commemorative for our daughterâ€™s first visit to a comic book store. I know that the guys have reviewed it before on the Major Spoilers Podcast, but I figured that I would go for the hat trick. To fans of the DCU TEEN TITANS, and even the TEEN TITANS GO! series, this book may be a disappointment. Art Baltazar & Franco have made a comic that goes for the fledgling reader. I would say that if the regular TEEN TITANS series was PG-13, and TEEN TITANS GO! was a PG, then TINY TITANS would defiantly be a G. Actually, if you could get lower than G, I would probably pick it. Think along the lines of some of the pre-school and kindergarten television shows, without the educational aspect, and you probably hit the nail on the head. Iâ€™ve heard fans of TEEN TITANS GO! having conniption fits over this series. Here is the thing I think people are missing though: The target audience for TINY TITANS is probably the lowest target audience since the days of Gold Key publishing Disney. This is a book that you could hand to your average kid learning to read and they probably would think it was a blast! Also, after passing this around to a few of my cousinâ€™s and friendsâ€™ kids, I found that little girls are much more receptive to the book. The boys (under 9) thought it was okay with a few funny parts, but the girls (12 and under) loved it! Iâ€™ve actually got to see if I can get a couple more from the comic shop because they wanted their own copies. A book like this could actually be used to get really young readers hooked (the younger the better), and then slowly introduce them to other titles, like TEEN TITANS GO!, JUSTICE LEAGUE UNLIMTED, and even some of the MARVEL ADVENTURES books. Would I pick this up every month for a kid that just discovered the Marvel or DC movies? Probably not. But I would grab copies for distribution in an elementary school or hospital, in a heart beat. If you take into account the target audience, and the reactions of the boys and girls I shared it with, I have to give TINY TITANS 3.5 out of 5 stars. All in all, we had a nice little family outing for Free Comic Book Day 2008. We got to check out a new (to us) comic store and met a few people. The selections were good and the free comics we got where worth the trip. Feel free to come over to the Major Spoilers Forum and talk about your Free Comic Day experiences!